Building Blocks Tuesday: Come on over! Welcome to anyone stopping over from Quilter in the Closet! I'm very excited to guest host Building Blocks Tuesday! If you're new 'round these parts, I'll do a quick introduction. I'm Alison, I've been blogging here at Little Bunny Quilts for almost four years and I've been quilting for more than half of my life! I live in Maryland with my husband and our pet bunny, Clara. By day I work at a nonprofit biotech company, and I also am the Bee Mama for the Stash Bee! Lately I have been seriously suffering from a lack of time to work on my projects, but I have a little progress to share! I also have one June Stash Bee Block finished up for Leo -- I'm planning to make her one more tonight -- under the wire, of course! This is a fun, BIG block -- 16 inches finished! I think if I were to make it again, I would try to eliminate some of the seams. I've really liked the blocks I've seen thus far that my other hive mates have made and I am very excited to see her finished quilt! I've also been working on a series of monthly scrappy wall hangings for my kitchen. You can check out more of that here! I finished up all of the fusible applique for my August wall hanging and now it has flowers and bees! Thanks again to Jen for graciously allowing me to host Building Blocks Tuesday! I'll be hosting again in a few weeks! Lately I've felt like I have been puttering along with my projects and not getting very much done. I've been working a lot in the evenings and on Saturdays at my second job so this seriously cuts into my sewing time. I have finished all of the centers of my Block Bs for my Romantic Garden quilt and started adding the outer parts to the centers. Lots of stitch and flip triangles going on here. 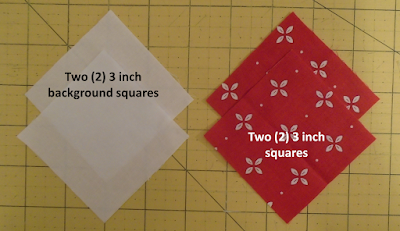 The pattern actually calls for two HSTs plus a square of the large light floral, but I didn't want to chop up the pattern, so I did stitch and flip corners on larger rectangles instead. Here are the last sets of side pieces ready to be sewn on to my Ohio stars. I also finally got started on my Halloween Mini Swap quilt! My plan is to make a mini row quilt wall hanging about 18" by 24". Here's the first row -- lil' candy corns! God bless my 60 degree ruler. I have lots of ideas for the other rows -- witch hats, black cats, bats, headstones, more candy, frogs -- but I'm not sure what to do yet! In other news, yesterday was my 27th birthday and my husband took me to the Maryland Zoo for the day and I got to feed Caesar the giraffe! Next to bunnies, giraffes are my favorite animals. And here are Park Ranger Husband and I hanging out with the penguins! Happy stitching! Linking up at Fabric Tuesday, Linky Tuesday, Building Blocks Tuesday, and WIP Wednesday! 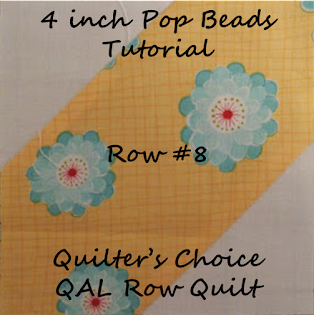 Welcome to the LAST tutorials for our Row Quilt QCQAL! I can't believe how fast this has gone by (again!) 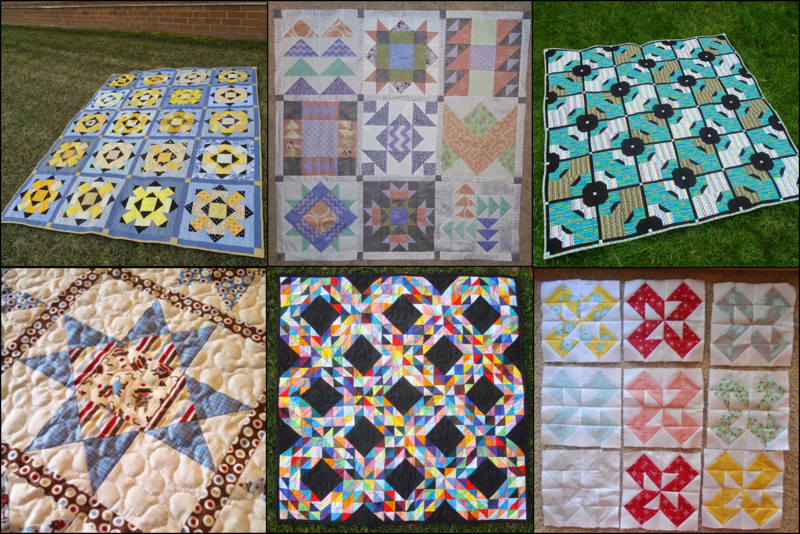 and that we're almost done with these beautiful quilts! Our next post will be on July 6th to talk about joining rows and finishing the quilt top. Draw a diagonal on each of your background squares and align each one with opposite corners of your 4.5 inch square. 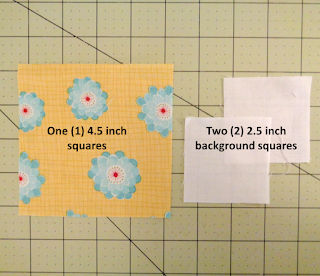 Sew each background square to the 4.5 inch square on the diagonal line. 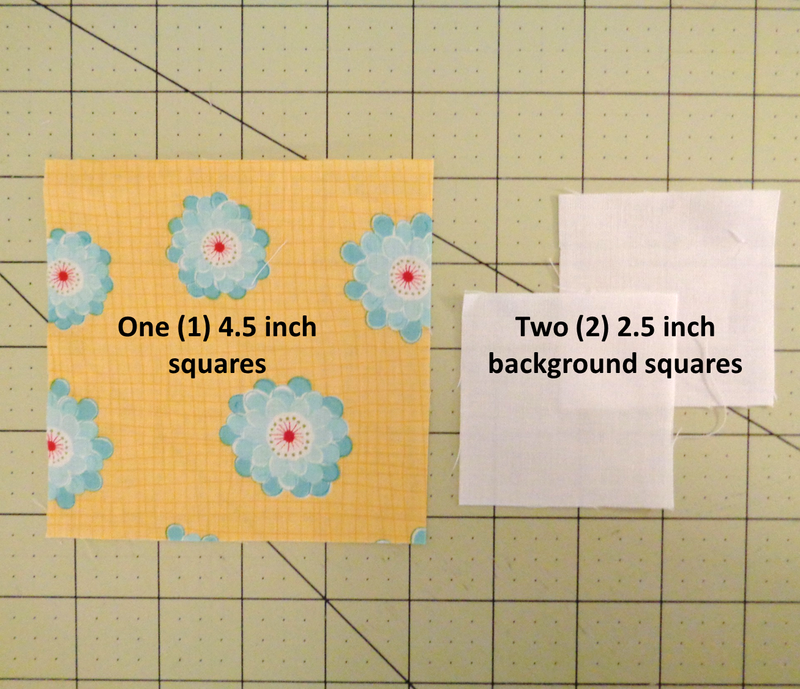 After sewing on each of your background squares, trim 1/4 inch away from each seam. 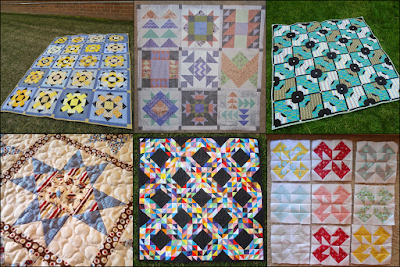 I have yet to make my third 4" row -- people making the twin sized quilt, don't forget! -- but here are all of my rows thus far! Now it's your turn to share your blocks! This week feel free to share anything you have finished up to this point! On July 6th, we'll have a link up for finished tops and for rows. This link up is going to be open until July 5th, so you have lots of time to work on your rows and get caught up! PS. Don't forget to follow Honey, Bunny, and Doll on Pinterest! Sharing over at Linky Tuesday, Fabric Tuesday, and Building Blocks Tuesday! I was able to finish up the last of my Block As for my Romantic Garden quilt over the last few days. They really do have more contrast in real life! Thirteen is an awkward number of blocks to photograph. C'est la vie. I also was able to finish up all of the QSTs that I need for Block B! And ta da -- eight of my twelve Block B centers completed! Lest you think that all I do is work on QAL stuff, I finally have some other progress to share! I've been working on my Block As for my Romantic Garden quilt and now have nine out of thirteen completed! Strangely enough, I'm missing three of my pink and green HSTs. I suspect a bunny might have stolen them. If I don't find them, I will have to remake them -- boo! I've also been working on my next two monthly wall hangings and making serious progress! July is all ready to be satin stitched! I plan to outline the white squares in either red/light blue/dark blue for contrast from whatever block it is in. I plan to outline the red flowers with yellow. Since it is much easier for me to get the fusible applique part done these days, I also started working on my August beehive. The pattern for this one also had a blue background, but I decided to go with purple with this one. This was actually one of the first backgrounds I had put together way back when I started working on these! Those stems will eventually have some pink or orange flowers on them. Linking up (late) at WIP Wednesday, Fabric Tuesday, and Linky Tuesday! This is the second to last week! Holy wow! This week we are making Broken Dishes blocks for our first 4" row. 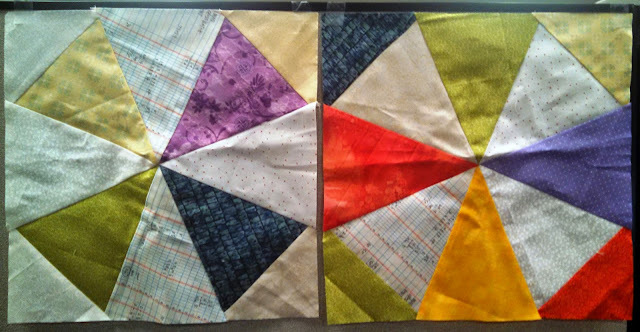 This is a good block if you have lots of scraps left as we draw near to the end! 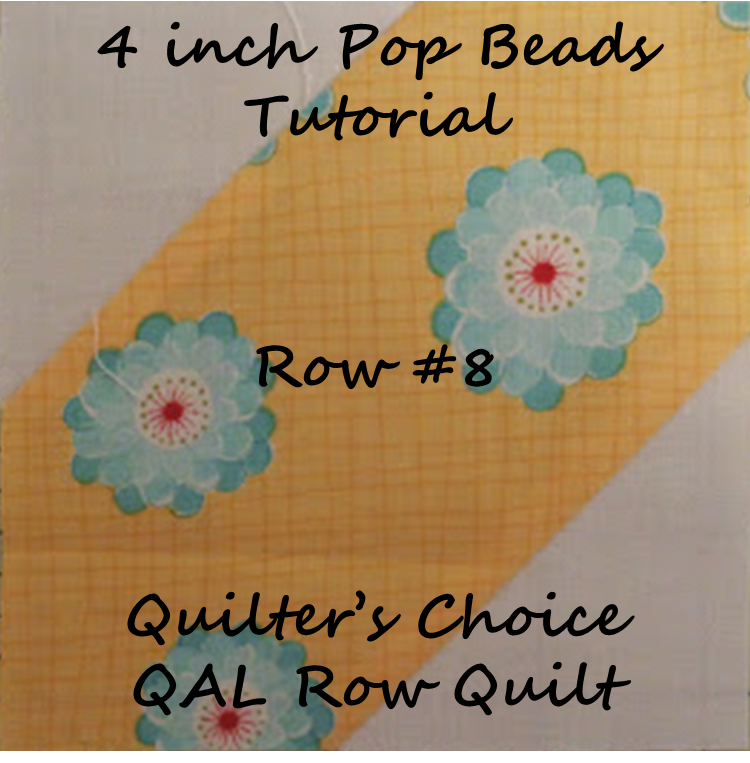 For the throw sized quilt you will need to make 12 units and for the twin sized quilt you will need to make 18 units. 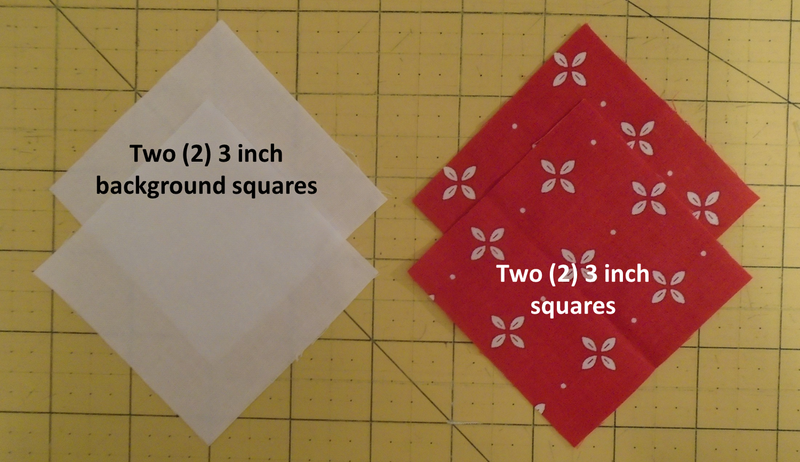 Pair up each colored square with a background square and make HSTs. You will need four (4) HSTs per block. 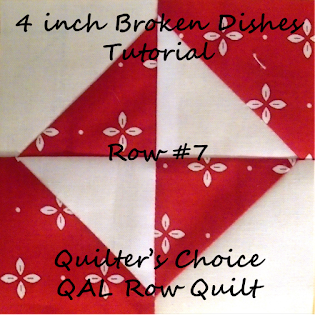 Sew together as shown, and repeat until you have your desired number of units! We can't wait to see what your blocks look like!